Bedroom storage can be a nightmare. What do you do if you’ve got too many things in your room and not enough space? Besides the obvious of getting rid of some of it, there are other ways to make this work. Are you a little confused as to what I mean? Just hang in there. You’ll be walked through the simple guide to sorting your bedroom storage out. When shelves won’t cut it, you need proper units. These units can come in many different designs and sizes. They can also be highly functional if you want them to. Say you’ve got a television in your room. Instead of just using the television stand, why not get a television stand and storage unit combo? Not only do you have somewhere to place your television, but dual storage units on either side for your DVD collection. Of course, nothing can beat a traditional chest either. That said, there’s little room for quick access when it comes to chests. Whatever is buried at the bottom is stuck there until you orderly pull the rest out. Be aware to keep the things you need closer to the top. A good set of ottomans can add additional seating and storage space to your room. With the lid down they’re plush bench-like seats. Lift the lid, and you’ve got a reasonably size storage trunk to fit all kinds of things in. You’re not limited to just one either. Why not place one at the foot of your bed, and another need the window? If you’re something of a clothes horse, you’re going to have a lot to wear. If you can’t possibly part with any of it, you’ll have to find yourself some more space. For an extreme solution to this problem, have a wall knocked through and moved back so you can inlay a wardrobe into it. You’ll have a wardrobe up to 15 feet long and 5 foot deep. If that’s not enough for you, you might as well buy a whole new house for your clothes. If you don’t have as much of a clothes problem but don’t want a bulky wooden wardrobe, there are options. You could get a plastic and fabric wardrobe out of IKEA. 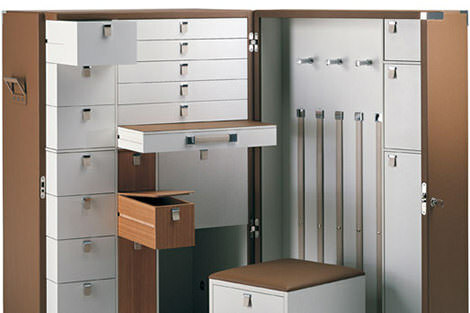 While you may take a little time putting it together yourself, you’ll have made a space conscious and portable wardrobe. Whether it is built into your divan, or you just have enough space under there. These spaces can be especially helpful when it comes to storing longer objects like a microphone stand or even a keyboard. Remember to get storage that goes widthways of the bed instead of lengthways. You’ll be able to fit in far more storage units that way and increase the overall storage potential of the room. If you’re still struggling for space even after trying most of these ideas, you’ve got to start thinking about letting things go. You can’t keep everything forever, at some point you just need less stuff.